Fun for all ages! 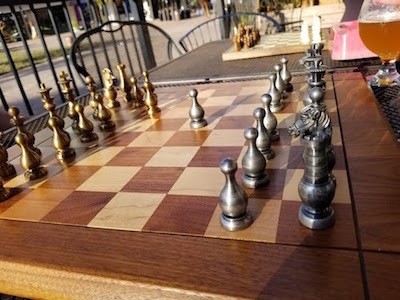 Whether you play chess or not, this is a great event for all. Come hang out with awesome people of this community, enjoy some tasty wine or beers from The Humidor’s fantastic selection and select from the highest quality cigars. Play, spectate or both. Players of all ages and skill levels are welcomed and challenged. Cigar smoking is optional, but it will get smoky. You’ve been warned. Chess boards will be set up on the front patio area of the Humidor for one-on-one games. Also featured are both Three Person and Four Person Chess Matches. Yes, you heard that right. If you’ve never experienced three-person or four-person chess, prepare to have your mind blown and skills tested. We may even break out Chinese Checkers and Backgammon as well. This event is hosted by Phillip “Crow” Gonzalez, Flagler County Realtor. You can call him directly for details (386) 569-1043 or to thank him to organize this event. He’s an excellent chess player and an all around good dude.